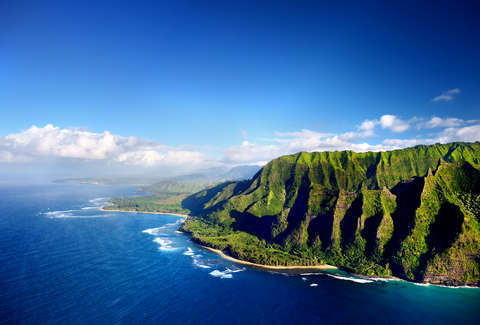 For people who've been dreaming of visiting Hawaii without tapping into their savings just to get there, lower flight prices to the far-flung archipelago in recent months have been more than welcome. As airlines announced new routes there, a competitive fare war broke out, with budget-minded travelers coming out as the undeniable victors. Now, yet another low-cost carrier is getting in on the action, and the move is poised to once again bring flight prices down for consumers. Spring break 2019 in Hawaii, anyone? Sun Country, the low-cost carrier based in Minnesota, just announced that it's ramping up to launch a new route from San Francisco to Honolulu, according to a report from The Points Guy. The move will expand the company's Hawaii-bound service, which it already offers out of Portland and Los Angeles. More importantly, though, the additional competition to woo passengers with cheap fares to the notoriously pricey state will most certainly bring flight prices there down across the board. Sun Country's announcement follows a similar one Southwest made in late 2017, when it said it would be offering new routes to Hawaii from a handful of major cities, which subsequently put pressure on other airlines who fly there to offer cheap fares. Southwest has yet to begin such service, which it hoped to have up and running by the end of 2018, due partly to the fact that it's still waiting for certain FAA certifications that'll allow for it, per Travel & Leisure. And while it's unclear when exactly Sun Country's new Hawaii-bound flights will start, it's entirely possible that they'll beat Southwest to the punch. Fares for the new SC flight will reportedly start at $259 one way, according to Bloomberg. In addition to the new San Francisco to Honolulu service, Sun Country also announced plans for its "largest network expansion" in its history and will begin offering 18 other routes from Las Vegas, Minneapolis, Nashville, Dallas, and Portland. Then again, if you can't wait to get a tropical vacation on the books in the first half of 2019, Southwest does have quite a few tempting non-Hawaiian offers up for grabs right now.